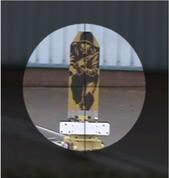 The Lazy 'N' Moving Target System, has been developed to provide the military marksman with a more testing moving target than the conventional constant speed crossing target. The track layout consists of three straight sections and two curved sections. When assembled and viewed from overhead the track resembles the letter 'N' canted over to one side, hence the name Lazy 'N'. Viewed from the shooting line (100mtrs. +) the target appears to change speed each time it moves from a straight section to a curved section. This results in the shooter having to continually adjust for the apparent speed changes as it travels across the range. Both the mains powered winch and the target mechanism are radio controlled, from either a handheld radio controller (C9172M) or from the control room computer via its radio interface in conjunction with other targetry on the range. Carrier An onboard sealed lead acid battery powers the target mechanism.